The presidential season is in full swing, and Americans have been barraged with seemingly patriotic messages and calls for changing the course of U.S. policy. Constitutional attorney John Whitehead, however, has some uncomfortable truths for even those who support Donald Trump: government is out of control and needs to be reined in. The final countdown has begun to the 2016 presidential election, and you can expect to be treated to an earful of carefully crafted sound bites and political spin. Despite the dire state of our nation, however, you can rest assured that none of the problems that continue to undermine our freedoms will be addressed in any credible, helpful way by any of the so-called viable presidential candidates. Certainly not if doing so might jeopardize their standing with the unions, corporations or the moneyed elite bankrolling their campaigns. In the interest of liberty and truth, here are a few uncomfortable truths about life in the American police state that we will not be hearing from either of the two leading presidential candidates. Our so-called government representatives do not actually represent us, the citizenry. We are now ruled by an oligarchic elite of governmental and corporate interests whose main interest is in perpetuating power and control. Republicans and Democrats like to act as if there’s a huge difference between them and their policies. However, they are not sworn enemies so much as they are partners in crime, united in a common goal, which is to maintain the status quo. Presidential elections are not exercises in self-government. They are merely business forums for selecting the next CEO of the United States of America, Inc.
No matter which candidate wins this election, the police state will continue to grow. In other words, it will win and “we the people” will lose. Americans only think they’re choosing the next president. In truth, however, they’re engaging in the illusion of participation culminating in the reassurance ritual of voting. It’s just another manufactured illusion conjured up in order to keep the populace compliant and convinced that their vote counts and that they still have some influence over the political process. More than terrorism, more than domestic extremism, more than gun violence and organized crime, the U.S. government has become a greater menace to the life, liberty, and property of its citizens than any of the so-called dangers from which the government claims to protect us. The government knows exactly which buttons to push in order to manipulate the populace and gain the public’s cooperation and compliance. Fear, which now permeates the populace, leads to fascism. The government does whatever it wants. You no longer have to be poor, black, or guilty to be treated like a criminal in America. All that is required is that you belong to the suspect class—that is, the citizenry—of the American police state. As a de facto member of this so-called criminal class, every U.S. citizen is now guilty until proven innocent. Any police officer who shoots to kill rather than incapacitate is no longer a guardian of the people. By appointing himself judge, jury, and executioner over a fellow citizen, such a police officer short-circuits a legal system that was long ago established to protect against such abuses by government agents. Whether instigated by the government or the citizenry, violence will only lead to more violence. Anyone who believes that they can wage—and win—an armed revolt against the American police state is playing right into the government’s hands. “We the people” are no longer shielded by the rule of law. While the First Amendment—which gives us a voice—is being muzzled, the Fourth Amendment—which protects us from being bullied, badgered, beaten, broken, and spied on by government agents—is being disemboweled. Government eyes are watching you. They see your every move: what you read, how much you spend, where you go, with whom you interact, when you wake up in the morning, what you’re watching on television, and reading on the internet. Every move you make is being monitored, mined for data, crunched, and tabulated in order to form a picture of who you are, what makes you tick, and how best to control you when and if it becomes necessary to bring you in line. Parents no longer have the final say over what their kids are taught, how they are disciplined, or what kinds of medical care they need. From the moment they are born to the time they legally come of age, young people are now wards of the state. All you need to do in order to be flagged as a suspicious character, labeled an enemy of the state and locked up like a dangerous criminal is use certain trigger words, surf the internet, communicate using a cell phone, drive a car, stay at a hotel, purchase materials at a hardware store, take flying or boating lessons, appear suspicious, question government authority, or generally live in the United States. Forced cavity searches, forced colonoscopies, forced blood draws, forced breath-alcohol tests, forced DNA extractions, forced eye scans, and forced inclusion in biometric databases are just a few ways in which Americans continue to be reminded that we have no control over what happens to our bodies during an encounter with government officials. Finally, we all bleed red. And we all suffer when violence becomes the government’s calling card. Remember, in a police state, you’re either the one with your hand on the trigger or you’re staring down the barrel of a loaded gun. The oppression and injustice—be it in the form of shootings, surveillance, fines, asset forfeiture, prison terms, roadside searches, and so on—will come to all of us eventually unless we do something to stop it now. These are not problems that can be glibly dismissed with a few well-chosen words, as most politicians are inclined to do. Nor will the 2016 elections do much to alter our present course towards a police state. Indeed, the popularity contest for the new occupant of the White House will not significantly alter the day-to-day life of the average American greatly at all. Those life-changing decisions are made elsewhere, by nameless, unelected government officials who have turned bureaucracy into a full-time and profitable business. What the founders wanted us to understand is that we are the government. There is no government without us—our sheer numbers, our muscle, our economy, our physical presence in this land. There can also be no police state—no tyranny—no routine violations of our rights without our complicity and collusion—without our turning a blind eye, shrugging our shoulders, allowing ourselves to be distracted and our civic awareness diluted. No matter which candidate wins this election, the citizenry and those who represent us need to be held accountable to this powerful truth. Constitutional attorney and author John W. Whitehead is founder and president of The Rutherford Institute. His book Battlefield America: The War on the American People (SelectBooks, 2015) and A Government of Wolves: The Emerging American Police State are available online at from American Free Press. Whitehead can be contacted at [email protected]. Chris, all of these comments appear to be directly on target regarding the sources of our peril, yet their assumption that the internet can make billions of proles aware that something more must be done just now than cringe and complain, that without REAL regime change right here in the good ol’ JuSA, civilization will relapse into barbarism for everyone. Nor does “Election 2016” offer any avenue out of this fever swamp whatsoever. For the Hasbara’s 1/2 percent minority, which like the Mossad specializes in doing wars by deception, outvotes sites such as American Free Press 100 to 1, the same way they did last century via their now-fading print mediacracy. With the money that’s behind them, an internet search for “White pride” will continue returning 100 “white supremacism” and “racism” hits for every straight answer. So let’s keep at what we’re doing, but ALSO give more support to the mere handful of straight and honest hardcopy newspapers like AFP jumping into that void slowly being vacated by those no-longer-relevant metropolitan rags. Another such highly-readable one is the “Southern agrarian” monthly, a 24-page tabloid, The First Freedom out of Silverhill, Alabama. 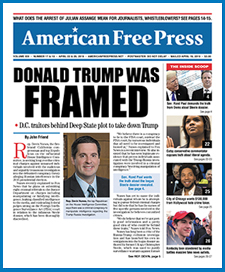 It’s also online, like AFP, for those too cheap to subscribe, at http://www.firstfreedom.net/1.pdf . I would also like to add that a lot of the author’s assertions aren’t backed up by evidence. Therefore they’re just opinions. However there are some assertions that have anecdotal evidence backing them up, although instances do not necessarily confirm trends, general practices, or conspiracies. p.s. Perhaps encouraging is that if the government ‘police state’ is as integrated as the author suggests, then having an outsider like Donald Trump for President is the best “waking up”solution Americans can choose as a first step toward regaining freedoms and re-establishing their Constitutional rights. Holy Moly, You make some very stark, sinister and extreme assertions. Recommending “waking up” isn’t exactly a practical solution. What, specifically, do you recommend we do to rid ourselves of this horrible police state? And please don’t just say “buy my book”. More Uncomfortable Truths you want hear from either Candidate or PC Media. Truth is Moral, Political Incorrect, Biblical Correct, soon to b a fraud, crime of Code. color of law. Fraud. Immoral “lies, theft and murderer” of men. KJV. Prez elections, ” selections,” fraud, are for the CEO of the UNITED STATES CORPORATION, Fraud, Democracy in Wash., DC, 10 sq miles, fraud, of Corruption, Destruction, Chaos, Lies, and PC LAWLESSNESS, not of AMERICA, usA,Republic, but of, subject to, Destruction, Corruption, Chaos, ‘lies, theft and murderer” of ” PC Lawlessness, “of”, subject to, CODE, “color of law”, fraud = Crime against WE the PEOPLE, the GOVERNMNT” LAW of the united states of America, Republic, UNDER God, “Christian America, 1776”, [ what is under God is a born again Christian Land of Liberty. Christianity “In His image.” 1620 Mayflowr Compact,] authors of the 1787 Original, only, Moral Law of the Land, the Constitution By, FOR, “of”, subject to, We the People, AMERICA = usA, Republic, Under God, “Christian America, 1776”, the . only, Free, “Self Governing’ White Men, the GOVERNMNT, [not a CORPORATION, Democracy. Fraud] in history. White, Hebrew, God’s Chosen Israelites, Matt 15:24, Anglo Saxon, and Sovereigns, Born again Christians, “sovereigns”, “gods”, ‘kings”, judges” KJV, Citizens, and “Citizens of heaven” ‘in the image’ of the Almighty Sovereign, “King of kings,” “Lord over gods” Judge of all judges, Destroyer, with the Saints, Christians, on Judgment Day, of the “sons of the devil.” KJV. Vengeance is Mine !” said Elohem. = The Father, Son and Holy Ghost.” Yah! Have a Nice & Holy Day my “fellow creations” on earth. Under God! Excuse typos. jim. 76.